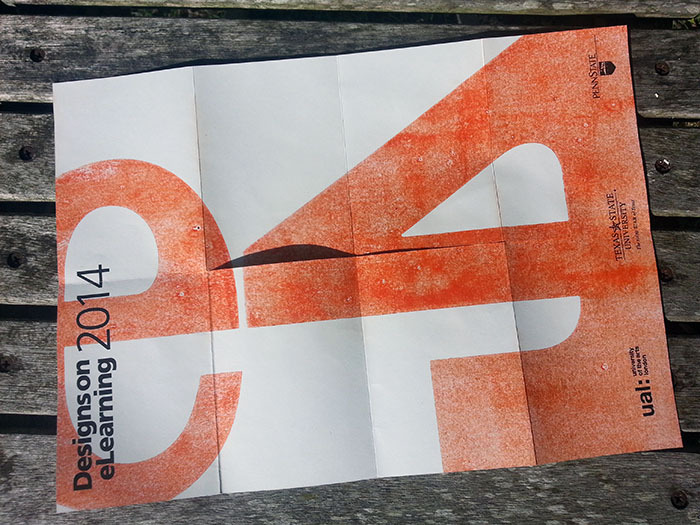 I was delighted to be asked to keynote at the Designs on eLearning conference last month. It’s run by my group based at UAL and Penn State with a different host institution each year. This time it was Texas State with Claudia Roeschmann et al doing an excellent job bringing us all together. ‘Digital’ is too broad a term to be useful now but it is still an area which is ‘different’ enough in the mind of institutions to be dealt with as a distinct entity. Whether this is a healthy approach is debatable as ‘digital’ and ‘technology’ tends to be defined as anything-that-is-new or anything-we-don’t-quite-know-how-to-use-yet. For example, technology that has become totally embedded stops being thought of as tech; email, texting, Googling etc. It’s not that we don’t know that it’s digital we just don’t discuss it in strategic terms because ‘everybody does it’. That tends to mean that digital strategies point towards incorporating the new without focusing on the better use of the mundane. To attempt to break down the digital into manageable areas I suggested the following ‘practice boxes’ or categories which split the manner in which we use technology into three sections. This provides a very simple framework for discussions about where and how practice intersects with, or resides within, the digital. My Visitors and Residents framework underpins this approach which means that the boxes build on motivation-to-engage rather than the functional affordances of the technology (something which can be considered after you’ve decided what it is you are trying to achieve). ‘Tools and Stuff’ – This is the predominant institutional perception of what digital technology is – a series of tools that help to make existing practices more efficient or better quality. It also tends to be students main expectation of the digital services their institution will provide. ‘Give me access to the right tools (including the Web) and access to digital content (stuff) that will help me get through my course. This was one of the key findings from or recent work on The Digital Student project for Jisc. No social trace is left in this mode which is mainly about information seeking, and non-visible production & consumption. ‘Shop Window’ – This is a shift from Tools and Stuff towards using the Web as a place for publication and dissemination – the look-at-what-I-have-created motivation which is essentially using the Web as a means of distribution for self-generated content. This is institutions and individuals in broadcast mode and while work that is being presented might be ascribed to the creator of that work it is not necessarily connected to a persona as such beyond a name or a brand. The Web becomes a location to promote the best of our completed work with the actual creative or intellectual practice taking place offline or in non-visible tools. Using digital spaces to communally or collaboratively create work. For example, collaborative editing of Google doc or using an online whiteboard/sketching platform to build work in groups. This type of activity could be ‘live’ or asynchronous but the closer to live it is the more the digital will feel like a space rather than a tool. Discourse around artifacts. – This is the most common form of activity within this category and is possibly the most broadly relevant in an educational context. I’m most interested in forms of discourse which influence the evolution of work, for example a constructive discussion in the comments on a blog post which leads to the original author refining their ideas. It could also be the discourse of a group negotiating the direction of future activities and posting iterations of work which is developed outside of the digital space in which the discussion is taking place. 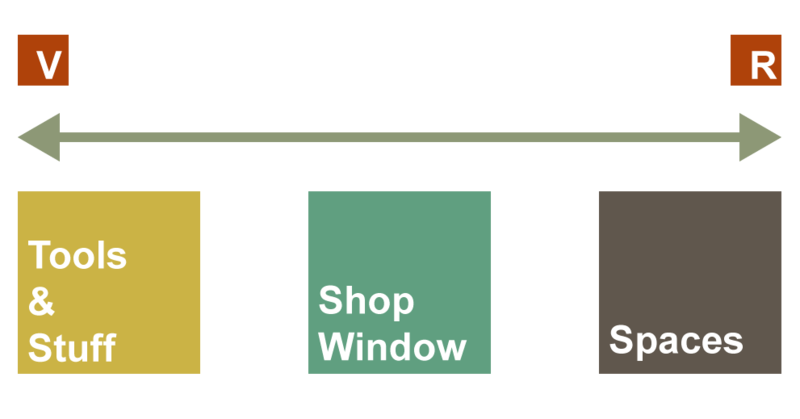 Obviously material that is posted in Shop Window mode can become the focus for discourse with the possibility of recontextualisition or remixing. Critique or re-appropriation of digital spaces – this one is more specific to Art & Design but important nevertheless. The digital is a space that should be questioned a deconstructed as a place where society resides and operates. This is something that the creative arts need to be doing if they wish to be a relevant voice. I was disappointed with the recent Digital Revolution exhibition at the Barbican which made no attempt to deconstruct the digital in this manner and simply presented a parade of amusing and entertaining digital bits and bobs. In an age of ‘elegant digital consumption’ Art & Design needs to re-present the Digital through a critical and questioning lens. What’s interesting is how the pedagogy we use can shifts teaching practice from Shop Window to Spaces within given platforms. For example at UAL both our blogging (WordPress) and our ePortfolio (Mahara) platforms can be used in both modes depending on the teaching approach. It’s even possible to gently transition from Shop Window to Spaces within these platforms over time which has enormous potential for supporting students in developing their practice and in building professional/practice based online personas. My hope is that the 3 categories will frame conversations within and beyond UAL and break down the ‘digital’ in a useful non-tech-deterministic manner.